MARSHLAND, named after Rice University’s founder William Marsh Rice and Houston’s geographic legacy as a swampy landscape, combines painting and sculpture to express Gaia’s larger-than-life impression of Houston's sprawling urban landscape, increasingly international demographic, and Rice University's relationship to the city. 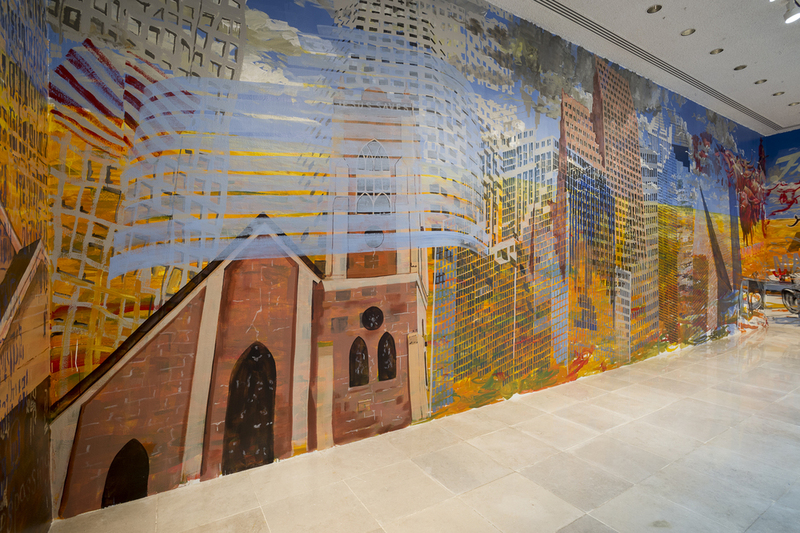 A floor-to-ceiling mural painted on three gallery walls is what Gaia calls “an impossible portrait of this massive metropolis.” Riffing on the style of landscape painter Frederic Remington's depictions of the Old American West, Gaia frenetically layers images and symbols of Houston to show an urban “frontier” of unrelenting change and movement. Downtown Houston's recognizable skyline dissolves into abstract panels of glass facades obscuring historic sites, such as shotgun row houses and Antioch Missionary Baptist Church. A herd of cattle symbolize how investors often follow the same speculative trends. Portraits of entrepreneur George R. Brown, architects Philip Johnson and John Burgee, and Rice architect Ralph Adams Cram peek out from the fray as representations of pivotal figures who have shaped Houston and the Rice landscape. A flock of migratory gulf birds fly toward signs of ethnic businesses, culled from the second ward, Montrose, and Bellaire areas of Houston, to signify how immigration follows opportunity and desire for a certain quality of life. 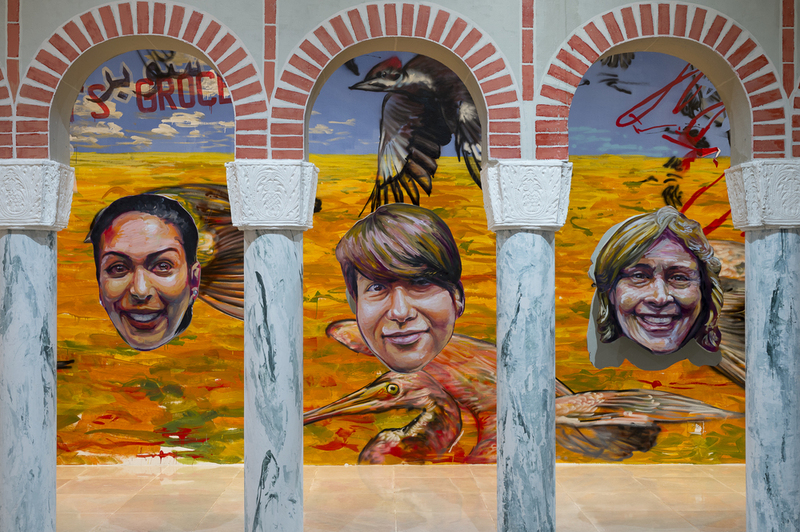 The mural surrounds a sculptural colonnade painted to mimic the formal architectural style of Rice's quadrangle and placed in the center of the gallery to echo the campus’ spatial proximity to larger Houston. 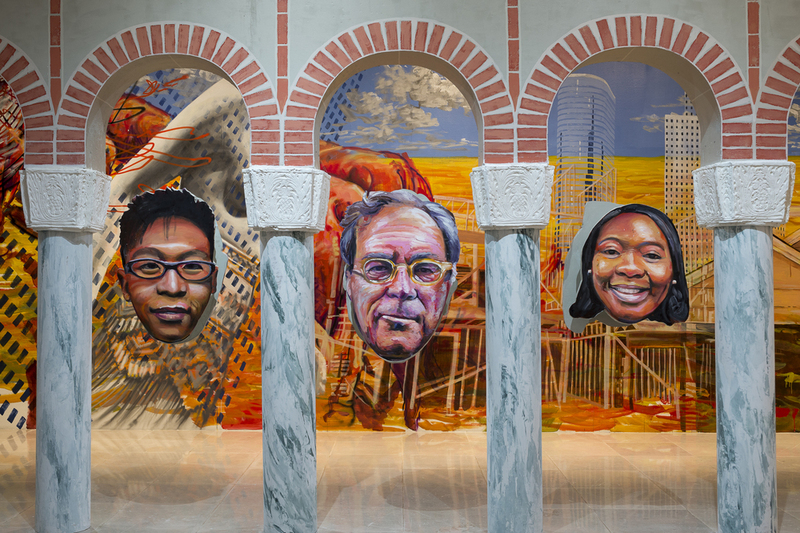 Hanging from each archway is an oil painting of a Rice student, staff, or faculty member interviewed by Gaia during his installation residency. A “chorus of voices,” as Gaia calls it, the portraits give a joyful, human face to the city and the Rice community without any outward indication of job title or hierarchy. Inside the cloistered space, visitors can read small “zines” about each individual to learn more about their story. Prior to beginning his installation, Gaia visited Houston from Baltimore where he lives. Over the course of a whirlwind, three-day visit, he toured the city and met with Rice professors Stephen Fox (Lecturer, School of Architecture) and Stephen Klineberg (Professor, Sociology and Co-Director, Kinder Institute for Urban Research); Linda Shearer, Director of Project Row Houses; Danielle Burns, Consulting Curator at the The Gregory School, Houston; and Rice Gallery summer interns Jessie Anderson and Emily Nichol. His first impressions of Houston were of a prosperous urban center, and in contrast to the Northeast, a city little affected by economic downturns, such as deindustrialization. He also saw things that stuck with him and found their way into the final mural. For example, his visit to the Gregory School and Freedmen’s Town presented the image of an old row house set against the Houston skyline of corporate skyscrapers, the incongruous downtown location of the Antioch Missionary Baptist Church, the oldest African American Baptist church in the city, and a visit to the Museum of Fine Arts Houston is where he saw paintings by Remington and Hiram Powers’ sculpture The Last of the Tribes (1867-74), which shows a Native American woman looking over her shoulder as an allegory for cultural loss and change. After this cursory glance where he barely skimmed the surface, Gaia plunged into books and articles about the city. He researched where oil money has gone, where financial institutions that service the oil business invest, the history of the Fourth Ward and different neighborhoods, the architecture of downtown, various prominent individuals, demographic surveys by Rice professor Stephen Klineberg, the shift from manufacturing jobs to financial services, and the emergence of a new economy based on high technology, medicine, and energy. When he returned for his three-week residency in Houston, he continued following these threads and discovering new ones while interviewing staff, faculty, and students at Rice. Participants were found through recommendations of colleagues, like Jennifer Bratter, Associate Professor of Sociology, and David Medina, Director of Multicultural Community Relations in Public Affairs; the heads of student associations, and Rice Gallery’s pre-existing contacts. The sampling was random, haphazard, and allowed for an organic mix of international students, second-generation immigrants, native Houstonians, long-time residents, a recent Rice alumna, and even Rice University President David Leebron. In his interviews, Gaia asked people what brought them to Houston, why they stayed, where they have lived, and how they view Rice’s relationship to the larger city. After these interviews, Gaia selected individuals to feature in the installation that reflect a mix of ethnicities, cultural and economic backgrounds, gender diversity, and a wide map of places lived from the Heights, to the Fifth Ward, to Pearland, to Sugarland, and beyond. This diversity reflects Rices effort to become a more diverse, open-minded 21st century institution, but interviewees did not gloss over a past of racial exclusion and ethnic tensions that still exist. For example, Dr. Roland Smith, who oversees the Office of Diversity and Inclusion, spoke about when African Americans were excluded from campus and stories of people having to walk around the campus gates. Dr. Richard Tapia discussed how his own identity as a Mexican-American is perceived in complex ways because of his position at Rice. Others talked about broader issues beyond Rice. Elizabeth Korver-Glenn, a sociology PhD student, discussed her own ethnographic research of the neighborhood she lives in called Northside, a prominently Latino neighborhood near the Fifth Ward. Talking with neighbors and people in the community, Korver-Glenn is trying to understand contentious issues of gentrification and development. LemLem Terke, a member of Rices custodial staff, described coming to Houston 23 years ago as a refugee to escape the war in Eritrea in East Africa. Gaia found that outside of the campus of Rice hardly anyone finds Houston to be a beautiful place (probably unsurprising to Houstonians), but that most interviewees found the people who live here and their open, welcoming spirit to make up for the aesthetics of the place. Houston has such a future, and it has such an ability to adapt itself according to various business climates, global dynamics, and the economy; whereas if I am in Rochester, it feels like the story has already been told. This is a totally different American city experience than the Northeast. I am fascinated by the incomprehensible energy, size, and scope of Houston, which on the surface may appear to be a bland metropolis. There is a tremendous sense of interconnectivity in the ways in which people relate to one another and navigate their city. Born in New York City, Gaia holds a BFA in Interdisciplinary Sculpture from the Maryland Institute College of Art (‘11). Recent museum commissions include Gaia and the Girl Scouts: A Live Painting Project at the National Portrait Gallery (2012), Smithsonian Institution, Washington, DC, in which Gaia created a large-scale on-site portrait of Juliette Gordon Low, founder of the Girl Scouts to celebrate the Scouts’ 100th anniversary, andRemington Project (2012-13), an installation for the Baltimore Museum of Art. He curated Open Walls, a street art project for Baltimore’s Station North Arts & Entertainment District for which street artists from around the world contributed to an outdoor mural exhibition. Solo exhibitions include Maxwell Colette Gallery and Pawn Works, Chicago; Jonathan Levine Gallery, New York City; Gallery Heist, San Francisco, and Irvine Contemporary, Washington, D.C. Gaia has had residencies at Ewha Women’s University in Seoul, South Korea and at Acrylic Walls in Johannesburg and Cape Town, South Africa. His work has been featured in The New York Times, Washington Post, Time Out Chicago, and The Baltimore Sun. Gaia lives and works in Baltimore, Maryland and Brooklyn, New York.